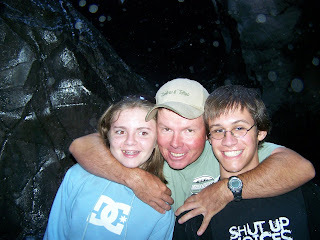 The 4 Mcclellan's: Vacation Photos.....finally! 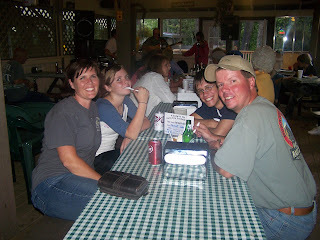 This is at the KOA in Ouray they had BBQ and live bands, and I was really excited some one offered to take our picture because we have so few of our whole family together! Here are the 3 most important people in my life, and look the kids aren't even fighting! We always seem to end up with some theme to our vacations. 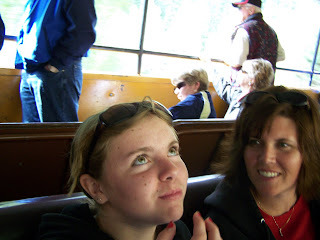 Last year all the pictures are of my family pointing at signs, and scenic things with a straight face (no smiles), they say that is how all the pictures in the old days were taken. So this year our theme turned out to be hats! I have a bizillion pictures of them in hats. We never plan this, it just seems to happen! 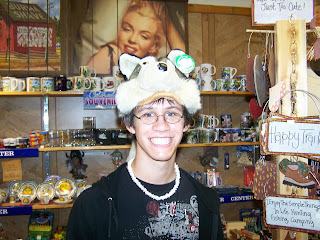 So.....here is one of Caleb's hat pictures. He was a good sport, even if he is a teenager! 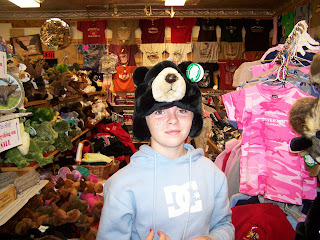 And here is Aryn, she is appropriately wearing a bear hat, which is her nickname. You would understand if you ever had to wake her up for school! 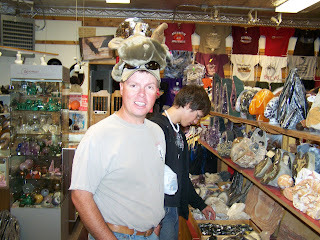 And Clark, the go with the flow dad, even if "what the..." is coming out of his mouth! Good times! I call this one "mom witnesses yet another blonde moment!" Really she is probably rolling her eyes at something I just said, but I like it better my way! 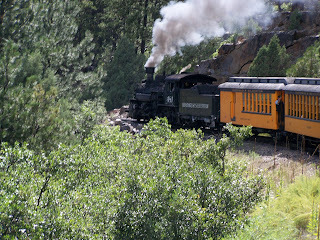 By the way, we are on the Durango and Silverton train waiting to leave. 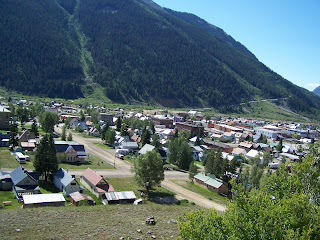 This is the town of Silverton. It is really neat, it still has all the old buildings from the railroading days, and only a couple of the roads are actually paved. Here is the picture of the Silverton train that Clark took. It is a gorgeous ride, and we have done it every August for the past 12 years! This is the last one I will post, and it is actually from last years ride on the Cumbres and Toltec in Chama New Mexico, but I love the looks on Clark and Aryn's faces. They are so much alike, and they just don't get each other! Looks like you had a fun vacation. Your kids are so cute! How fun!! What a fun idea to have some sort of theme on your vacations! I will have to remember that!! I want to see what your hat looked like! You have such a cute family!! I'm glad you guys had a great vacation!! It looks like you had fun. My mom said she ran a little with you at the 1/2 marathon but couldn't keep up with you. Good job!